In 1915, Albert Einstein and Wander de Haas reported that changing the magnetization of a suspended iron rod by applying an external magnetic field leads to mechanical rotation of the rod. This intriguing observation still serves as the textbook example of the association between magnetism and angular momentum. New questions concerning that link arose, however, when a phenomenon known as ‘ultrafast demagetization’ was discovered some 20 years ago. There, magnetization is lost on the timescale of picoseconds and below, and the issue of ‘where does the angular momentum go’ became the subject of intense debate. Reporting in Nature, a team of physicists at ETH Zurich, the Paul Scherrer Institute (Switzerland) and the SLAC National Accelerator Laboratory (US) now settle that very question. They demonstrate that in a ferromagnetic iron film, the majority of the angular momentum is transferred to the lattice, slightly twisting the sample as its magnetization rapidly decreases. 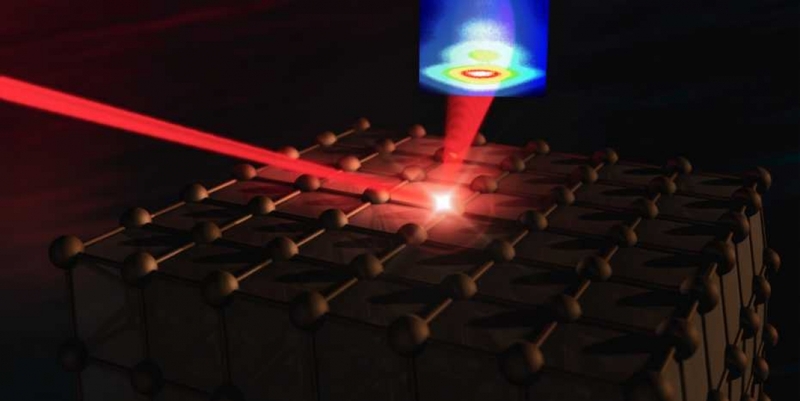 Showing that an ‘ultrafast Einstein–de Haas effect’ is at play in this scenario rules out other explanations and should provide guidance for explorations of how ultrafast demagnetization can be put to technological use. An international team led by ETH physicist Steven Johnson used femtosecond time-resolved X-ray diffraction experiments to uncover what happens when an iron sample is abruptly demagnetized upon being hit with a laser pulse.